Our highest purpose as an organization is to improve the quality of life for our members in San Juan County. The most important thing that we can do to realize that vision is to manage our Co-op resources wisely. We serve more than 11,200 members on 20 remote islands with an automated electrical distribution system and fiber communications grid. For today, we are maintaining those resources to maximize member benefits and minimize costs. For tomorrow, we are expanding those systems and using technology to meet our future needs and prepare to deliver the same high quality of service in a rapidly changing environment. Invest in things that reduce cost. We know that change is not easy. However, our growth has been flat since 2008 and costs continue to rise. In order to meet those costs, spread over 11,200—which is a small number compared with most utilities—we must be frugal with expense and innovative with solutions. Rock Island Communications is one such solution. Our wise investment today will pay dividends in a future revenue stream to help the Co-op meet the ever-rising costs of power and fixed expenses such as labor and the facilities required to serve these 20 islands. This generation of Co-op members is witnessing—and carrying some of the costs for—big changes in our Co-op, the utility industry and the world. Our Low-Income Needs Assessment showed us that the cost of living in San Juan County is going up in all areas. Housing is the greatest challenge for affordability, but transportation, medical and insurance costs, groceries, and utility bills are all on the rise. OPALCO is leading the countywide effort to address affordability with our new Energy Assist program, providing a monthly bill credit to qualified households. Project PAL is still available for those in need of emergency assistance. This publication reports on our progress in 2015 in the 3 major areas of our business: Communications, Finance and Energy. In the near future, we see that OPALCO will shift from being a provider of power to a servicer of power. We will be managing a growing number of intermittent resources on our grid, such as solar, wind, electric vehicles and battery power walls, and, hopefully, even tidal power. Our grid must be able to rebalance resources instantaneously: to bring on some battery storage when cloud cover shuts solar production down and to reroute power in a blink when outages occur on the system. Our grid is in good shape, but we must continue to expand the reach and capacity of our grid to meet the needs of the future. All utilities are moving in this direction, and OPALCO must not be left behind. We have very low interest rates today and can make the necessary capital improvements now for a sustainable system into the future. Read more about Communications. Tightening our belts. We cut expenses by $923,000K compared with budget in 2015. Lower power sales were a major factor, along with making wise decisions to reduce expenses wherever we could. Positioning Rock Island Communications to return a profit to the Co-op in the form of a future revenue stream. Co-op revenue will go up. In 2015, we completed a comprehensive Integrated Resource Plan (IRP), designed to raise questions and foster insight about our future power supply with the Co-op Board, management team and membership. It is the result of a year of research and analysis, exploration of energy topics at Board meetings, energy roundtables and fairs, and discussions with community leaders and visiting experts. The IRP is a “living document” updated periodically to catalyze constructive discussion on our energy future. The IRP helps explore the resources needed to meet OPALCO’s goals as we look to meet the energy demand of our Co-op members into the future. We encourage members to read the IRP and become familiar with the Co-op’s goals and the trends and issues related to our energy future here in the islands. We have also joined the Pacific Northwest Generating Cooperative (PNGC Power), joining with 14 other distribution utilities to take advantage of wholesale generation options, aggregation of regional loads and resources, and PNGC’s sophisticated power management services. When our current contract with Bonneville Power is up for renegotiation in 2028, we will have a portfolio of options to choose from in planning our future power supply, and we expect Bonneville and their regional hydro resources to remain the foundation of any power plan we create. Read more about Energy Services. We are proud of our team at OPALCO, the reliable and modern system we are building, and the role we play in contributing to a good quality of life in San Juan County. We thank our membership for inspiring and supporting us toward this vision. In June of 2014, we successfully purchased an FCC licensed frequency (700MHz) for the OPALCO grid control network to advance our wireless communication capacity. In February 2015, we successfully purchased a local Internet service provider, Rock Island, and merged operations with OPALCO’s Island Network. Rock Island Communications, a wholly owned subsidiary of OPALCO, is a for-profit company with the expertise to expand Internet services to our membership, as the Board directed in 2013. This past year was a wild ride, as start-up businesses and mergers tend to be. Rock Island and Island Network merged operations, hired staff and developed new administrative systems while simultaneously constructing new fiber connections and designing a fixed wireless LTE network. As we were testing the initial LTE design, T-Mobile stepped up to provide a more robust solution including their equipment, additional spectrum and the substantial expertise to build and manage our fixed LTE network. Not only did T-Mobile’s partnership solve the problem of a fixed LTE wireless system for Internet services countywide, but the agreement was a net zero exchange that allows T-Mobile to offer cellular phone service to San Juan County. A true win-win for our membership. As of December 31, 2015, Rock Island Communications had built 489 fiber connections and 39 fixed wireless LTE connections. The total subscriber count was close to target on the fiber side but fell short on the LTE side because of delays when we retooled our plans with T-Mobile. The T-Mobile agreement reduced the total number of poles required to complete deployment from 120 to 38, but required us to accelerate deployment by year-end 2016 from the 6 LTE poles planned to 31. With T-Mobile on board, services will be available to most of San Juan County by year-end 2016, compared with 25% of the county in the previous “go it alone” plan. For 2016, the pipeline for fiber subscribers is already full and LTE deployment is ramping up. Since January 1, 11 active LTE poles have been deployed and 31 of the 38 poles will be active by year-end, more than compensating for the subscriber delay in 2015. Rock Island Communications now has 2 offices open and a great team on board with 22 full-time employees and another 4 new hires budgeted in 2016. After merging, Rock Island’s administrative and accounting systems are in place, and San Juan County residents are starting to enjoy the benefits of high-speed broadband and true connectivity to the rest of the world. OPALCO finances are in good shape. We ended 2015 with our equity as a percentage of total capital at a healthy 53% and our TIER improved to a healthy 2.5. After a year of shrinking kilowatt-hour sales, our cash flow from Operations is positive. Our current debt (as of year-end 2015) is about $35M. We project debt of about $48M by year-end 2016, which includes $6M (2016 expenditures) for the Submarine Cable Project. Once the Submarine Cable project is complete in 2018, we project the debt to be around $52M and capital spending will taper off. OPALCO will refinance the loans to Rock Island Communication away from OPALCO and reduce overall capital debt financing down to a target of approximately $46M debt by 2019. Read more on OPALCO’s Debt and Equity. While Co-op revenue is driven largely by fluctuations in energy usage and dependent on weather, debt is driven by capital projects such as replacing submarine cable, undergrounding of distribution cables and modernizing the grid. As planned, capital spending for those 3 initiatives has tripled since 2012 during a period of very low interest rates. That capital spending will taper off by 2018. Read all about it in our 2016 Budget Presentation. In December of 2015, we distributed capital credits for members who were active in 1990. Because of the strain that low revenues and capital expenses have had on our finances, the Board decided to pay out 50% of capital credit distributions at year-end 2015. We expect the remainder to be paid out over the next 1-3 years as we catch up with our 25-year distribution schedule. Read all about capital credits. The necessary rate increases over the past 2 years have been challenging for our membership. We want to keep the energy usage charge reasonable so that electric remains the lowest cost way to heat homes and businesses. Ultimately, we need to collect enough revenue to cover expenses and minimize the volatility of weather fluctuations. Even with the recent rate increases, OPALCO still has some of the lowest rates in the nation. Our challenge is to keep costs down while maintaining reliable service to our 20-island territory, the miles of submarine buried and overhead cable, and nearly a dozen substations. Put simply, as with food and other essentials, delivering reliable electricity in our rural community is more expensive than the mainland, and those costs don’t go away with the season or with energy efficiency steps. Recognizing that this can be a special burden on members from low- and fixed-income households, OPALCO has, in addition to PAL and LIHEAP programs, added a third energy assistance program, Energy Assist, which provides a monthly bill credit. Qualifying for this new program is simple, and those who are eligible for PAL emergency grants are also eligible for this monthly credit. You can read more about Energy Assist here. Project PAL continues to provide emergency grants for members in need during the heating season, funded by member donations. In 2015, 2,282 members rounded up their monthly bills totaling just over $23,252.00, with an additional $6,798.00 of individual contributions. PAL grants were awarded to 171 members during the 2014/2015 heating season totaling $39,961.00, which is an average award of $233.69 per member. The Board also authorized a transfer of an additional $25,000 in 2015 to meet the unmet need. 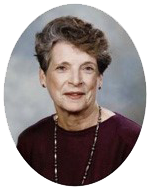 Nelda served as a founding member of the Project PAL Committee. Her generosity as a volunteer made a big difference in the lives of Co-op members in need throughout San Juan County. Her daughter Beth Anderson and son-in-law Kerry Anderson retired from OPALCO in 2014. Our condolences go out to the family. Members want to be assured that OPALCO costs and Rock Island costs are kept separate. In fact, we don’t have a choice. They are separate, and this separation is required by IRS. Their regulations direct us to clearly separate the nonprofit side of the business, OPALCO, from the for-profit Rock Island Communications. Each company is independently audited by an outside accounting firm. OPALCO is additionally audited by our major capital projects lender, the Rural Utility Service. The IRS provides a third layer of audit in keeping with IRS rules for nonprofit and for-profit businesses. Take a look at the financial reports posted online, and you’ll see that income and expense for Rock Island Communications in the Balance Sheet section where we report on margins from our subsidiary. Our top-notch OPALCO accounting team makes sure we comply. Travis Neal, Head Accountant, and Patty Kelly, Special Projects Coordinator, joined the accounting team in 2015. Travis came to us from public accounting, where he served on OPALCO’s audit team for the past 4 years, and Patty transferred from the position of Member Services Supervisor. Members ask us why we continue to invest in energy efficiency, as it reduces revenue. The answer is that energy is costly to produce and purchase, and not to be wasted. At the same time that we help members reduce wasted energy, we know that electricity is the lowest-cost way to heat and drive. We are seeing more and more members switch to super-efficient ductless heat pumps and electric vehicles, which also helps keep electric revenue from being undercut too much. Members can save money, and we all benefit from reducing our carbon footprint. The Co-op has a number of critical energy and communication service initiatives rolling out. We recognize this is a sea change. We respect that some members don’t support these initiatives. For the rest, we appreciate the support you have given the Co-op. We all will benefit, each in our own way, from these investments in our cooperative and community. We encourage you to call us with your questions, attend Board meetings, subscribe to our monthly email newsletter, and check out the wealth of information available on your Co-op website at OPALCO.com. We are proud of our operations crew—3 line crews (3 General Foremen, 14 Journeymen Linemen and 2 Apprentice Linemen) on 3 islands serving a total of 20 islands; engineering professionals (8) and communications technicians (2). 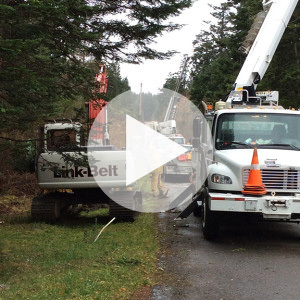 When a storm took out 7 poles on Shaw Island, our crews worked night and day and had power restored in just over 24 hours. Their safety is our top priority, and in 2015, every crew member was outfitted with a complete set of flame-resistant (FR) gear—specialized electrical industry clothing—to protect them on the job. In 2015, OPALCO joined the Rural Electric Safety Achievement Program (RESAP), a reciprocal safety inspection program run through our parent Co-op, the National Rural Electric Cooperative Association. Two of our operations crew: Steve Eyler, General Foreman, and Kai Burleson, Journeyman Lineman, became certified safety inspectors and will visit other participating Co-ops in exchange for the annual safety inspection teams that will visit OPALCO. This peer review lets Co-ops share the costs of inspections and puts qualified, working linemen who fully understand the work environment into the role of inspectors and puts them in charge of compliance for their own workplaces. Three key initiatives are under way on the energy side of the business. The biggest is the $15M Lopez-San Juan submarine cable replacement project. Spending on that project will end in 2018. Second, since 1990, the Co-op has invested heavily in undergrounding distribution cable to storm-harden the grid. To date, about 87% of our distribution is now underground, which means the number of instances of power outages is very low—far below industry averages—but the duration of outages is slightly higher than industry averages because of the time it takes to make repairs to underground equipment. The greatest weakness in our current system is underground cable that was buried directly in the ground during the early 1990s. In 2015, we continued to replace aging direct-buried underground cables with a priority on segments that have exhibited multiple faults. The third initiative is grid modernization, which has been ongoing since 2001, when we first began building out our fiber-optic network. We followed up with electronic automated meters, and a variety of automated grid control devices to improve reliability, reduce losses and improve efficiency. We are building a fiber communications loop throughout our system to allow us to connect the next generation of automated utility devices to assist us in keeping our reliability up and system maintenance costs down. Now through 2035, we will continue to upgrade our grid to allow for more local renewable energy, storage systems, community solar, intelligent home solar inverters and a vibrant energy market where Co-op members buy and sell energy at favorable rates. This initiative is being replicated across the country and here in Washington State, through the clean energy initiative. On the energy efficiency front, OPALCO members were so effective at taking advantage of rebates offered through BPA’s Conservation Program that we spent our own Co-op allocation, spent unused allocations from other Co-ops in the region and ended 2015 having pre-spent about 50% of our 2016/2017 allocation as well. Nearly $275,000 in rebates were paid to OPALCO members in 2015, and our running total since 2008 is $2,194,541. See the 2015 rebate chart. Rebates for appliances, heat pumps and water heaters are still available, while they last. We’ve put a temporary hold on weatherization rebates to make our funds last as long as possible. 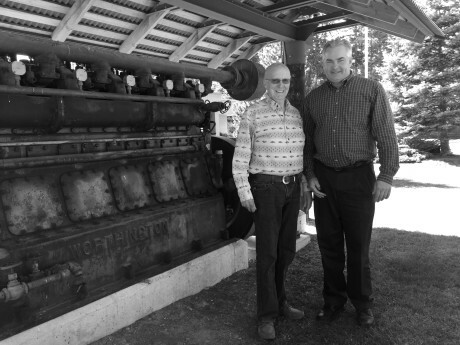 OPALCO continues to work with the San Juan Islands Conservation District for efficiency, conservation and renewable energy outreach and education. Plans for 2016: Energy Fairs, Take Charge Campaign to encourage fuel switching, Cool School Challenge, GUEP, Heat Pump Conversions in schools and homes, Outreach to increase EVs in the county, new EV charger installations in partnership with the county. The M.O.R.E. 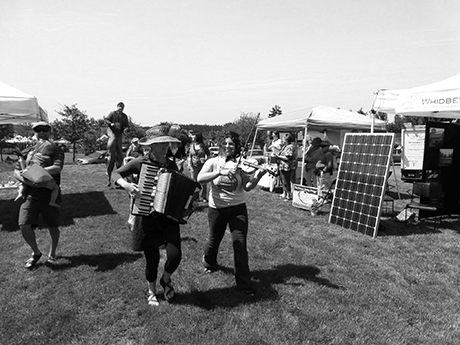 program is managed by an independent member committee to perform public outreach for renewable energy. The program is funded through voluntary donations, so all incentives are paid for by members. In order to continue to incentivize existing Member Generators, the committee opted to place a hold on future M.O.R.E. incentives until an increase in funding occurs, either by the membership or an authorized contribution by the Board of Directors. New Member Generators can still interconnect and get incentives paid through Washington State programs, and existing Member Generators participating in the M.O.R.E. program will continue to be paid using existing funds—all Member Generators will continue to provide the Co-op grid-tied power and offset the community’s demand for energy. OPALCO is run by a strong team of Co-op member-owner-operators who are dedicated to serving our membership. OPALCO offers employees a unique working culture where member service is combined with state-of-the-art technology. Employees work in a high-energy environment. Creativity, innovation and teamwork are supported and encouraged. Employees have the opportunity to learn and grow in their careers, including training in the latest technologies. OPALCO offers excellent benefits, including health care coverage, vacation and sick leave, pension, 401K match, competitive salaries and holiday leave. Job openings are posted on our website. 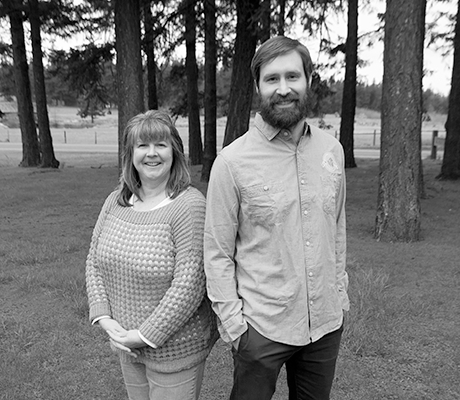 Also in 2015, we bid farewell to Jeanie Fodor, Member Services Representative, after more than 16 years of service in the Friday Harbor office and James Toole, Special Projects Coordinator, with 5 years of service in the Eastsound accounting office. We wish them both well in their next adventures! Democratic Member Control—Cooperatives are democratic organizations controlled by their members, who actively participate in setting policies and making decisions. Men and women serving as elected representatives are accountable to the membership. In primary cooperatives members have equal voting rights (1 member, 1 vote) and cooperatives at other levels are also organized in a democratic manner. Members’ Economic Participation—Members contribute equitably to, and democratically control, the capital of their cooperative. At least part of that capital is usually the common property of the cooperative. Members usually receive limited compensation, if any, on capital subscribed as a condition of membership. Members allocate surpluses for any or all of the following purposes: developing their cooperative, possibly by setting up reserves, part of which at least would be indivisible; benefiting members in proportion to their transactions with the cooperative; and supporting other activities approved by the membership. Autonomy and Independence—Cooperatives are autonomous, self-help organizations controlled by their members. If they enter into agreements with other organizations, including governments, or raise capital from external sources, they do so on terms that ensure democratic control by their members and maintain their cooperative autonomy. Education, Training and Information—Cooperatives provide education and training for their members, elected representatives, managers and employees so they can contribute effectively to the development of their cooperatives. They inform the general public—particularly young people and opinion leaders—about the nature and benefits of cooperation. Electric cooperatives began to spread across rural America after President Franklin D. Roosevelt created the Rural Electrification Administration (REA) in 1935. Today, 900 electric cooperatives serve more than 75% of America’s landmass. They provide reliable and technologically advanced service to more than 42 million Americans while maintaining a unique consumer-focused approach to business: members helping members.